Even though the United States look to have the tournament in the bag before the action gets underway, there is still hope that someone can spring a surprise or at least push them all the way. For most people, the team most likely to push the United States for the Gold medal is Spain. The Spanish side have a great pedigree in the major tournaments in recent times. They have lifted many of the European trophies and in the last two Olympic Games basketball events, they have ended up with the Silver Medal, losing to the USA both times. There are some people who think that this could be the year for the Spanish but they have received a few knocks and blows in the past week. This is because they are going to be without Serge Ibaka and Marc Gasol. Ibaka has decided that his summer would be better spent gear for the new season. With over 500 games for the Oklahoma City Thunder in the NBA, it is not as if Ibaka has anything to prove but his career took a new twist in June when he was traded to Orlando Magic. This will give Ibaka a chance to be a more influential player as opposed to just being part of the team and it is easy to see why he is determine to make the most of the opportunity. It wasn’t much of a surprise to learn that Ibaka was going to sit out the Rio Games but there was still hope in some quarters that he would decide to use the tournament as part of his warm-up for the new campaign. There is a greater sense of disappointment over the absence of Marc Gasol. Like Ibaka, Gasol has clocked up well over 500 games in the NBA, with the Memphis Grizzlies, but he has been injured of late and there were doubts over his ability to participate in this summer tournament in Brazil. However, when you have a talent like the younger Gasol brother, you have to give him every chance to be fit for the tournament. Gasol already has two Silver medals from the Olympics but he will be denied the chance of getting another medal in Rio. There were a few positive aspects for Spain to focus on in their recent friendly victory over Angola, winning 85-61. 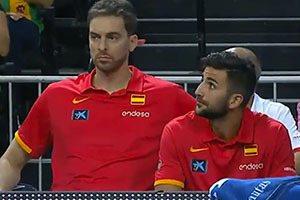 There was 19 points from Nikola Mirotic while Felipe Reyes and Alex Abrines worked well to deliver 29 points for the Spanish side. There was also a lot of pleasure to be taken from the international debut of Ilimane Diop. The 21 year old slotted into the side, grabbing 11 minutes from the bench and he managed to pick up 4 points, 3 rebounds and a block in that time. With the two Gasol brothers being absent for the game, Diop added some height and a presence that extends beyond his age.